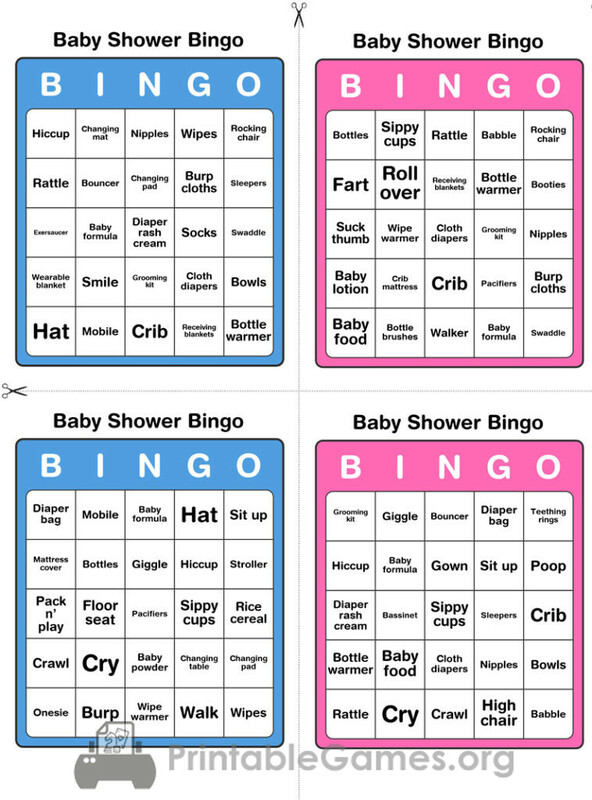 A Baby shower bingo is one of the most played baby shower game. Like the regular bingo game the format of the game is simple, each of your guests are handed over one of the baby shower game card and they then need to strike out the called out words till they get a BINGO!! The mom-to-be starts opening the baby shower gifts she has received from the guests and as she opens her gifts she calls out the name of the gift she received, and the guests strike out the word from their baby shower bingo card. The mom-to-be continues doing this till one of the guests gets a BINGO! This is the traditional way of calling out the words from the list of words which are printed on a sheet and these words are on the bingo cards, the caller keeps calling out the words till one of the guests gets a bingo!! Below you will find two colors of the Baby Shower Bingo Cards a Pink (If your baby shower theme is pink) and Blue (if your baby shower theme is blue) a total of 50 cards and a list of words to call out! Print them and play baby shower bingo with your friends and families! Note : If you don’t want to reveal the gender or if you do not know the gender print 25 of each the pink and the blue cards and mix them and distribute.